Are you an Educator with an eye for the perfect snapshot? Or not? But you do notice! All educators notice the little things, and the big things, that make a difference in our daily lives. Would you like to join a group of educators who have learned the joy of sharing those small things [or big things] through photos? Don’t panic! It’s not 365 photos! It’s a Friday Foto Group called TFotoFri, Teacher Photo Fridays! You can write about your photo in a blog post, upload your picture on Flickr, or do both. Other ways to share? Let us know! Use the tag on your Flickr photos. Tell others about your post by using the tag on Twitter. Relax and enjoy the photo challenge. When it gets too challenging, when your week is too busy and you don’t get it done, don’t feel pressure or guilt. We are educators, for heaven’s sake, so we all understand how that will inevitably be part of the challenge! #TFotoFri Crew: Time for an upgrade and renewal! Our photos are fantastic; we’ve shared important engagement, creativity, happiness, structure, metaphor, groups, and collaboration within our lives. How about a new twist? Basically, it’s the same with a new name: Texture, Mixture, and Me. What are the textures of your lives: appearance, character, consistency, quality of elements. What are the mixtures that make things interesting: mixes of differences? What is the “Me” of you this year: your art, visuals, hobbies, interests, etc? As always, this is flexible; include your photos from other groups if it fits better. And, Thank You for sharing! Inspired by a wonderful summer of photo sharing with #JJAProject, Denise and Sheri started this group for educators who are interested in sharing a photo each Friday. The photo you share can be personal or professional, taken anytime during the week and posted as close to Friday as you can. Here are the posts that inspired us to create this group: Denise and Sheri. Please join us! 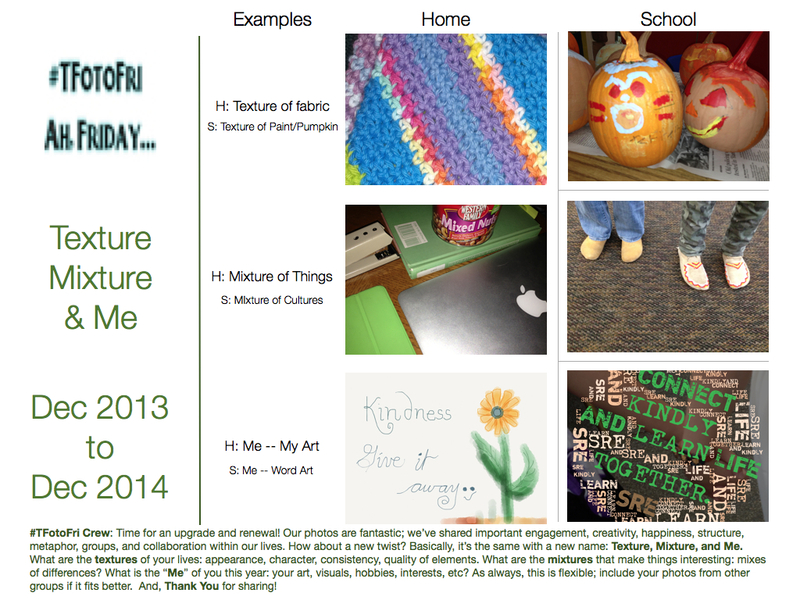 Join here: TFotoFri, Teacher Photo Fridays! Yeah, Sheri! Thanks for writing this up. I’m excited to start looking for textures, mixtures and photos that represent me. It has made a world of difference when I started noticing and taking pictures again after a few years hiatus. Thanks for keeping us encouraged to contribute and collaborate. Yes. It should be fun to mix it up a bit, think out of the box about mixture, texture, and who we are as people. Thanks for encouraging this; it makes the day better knowing we’re sharing a bit with others.